When you're a pirate, raising a little one can be tough. Trying to pass on your swashbuckling ways to your kid is hard enough, but with the rapidly diminishing supply of doubloons and buried treasure to plunder, it's a wonder how a buccaneer can even rear a youngin' up these days! That's why it's important to take advantage of a good deal when you can find one and boy do we have a deal for you. This Pirate Infant Costume brings you the finest in scallywag attire for your little one! 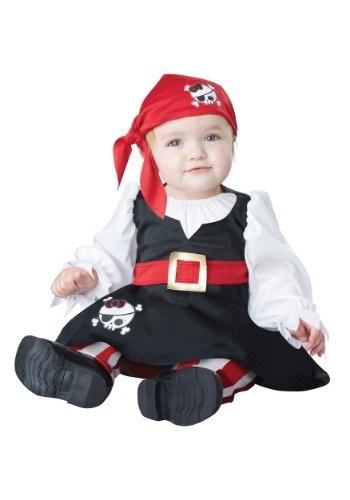 Not only does it provide your tiny pirate with an outfit that's fit for carrying on the family tradition of piracy, but it also won't cost you a boatload of doubloons to get it! You'll be ready to teach your child the ways of the sea, so your little one will be ready for an adventure as your first mate in no time.